Set off with your guide on your exploration of city landmarks that are more than worthy of the time and effort it would take to see and appreciate their beauty. 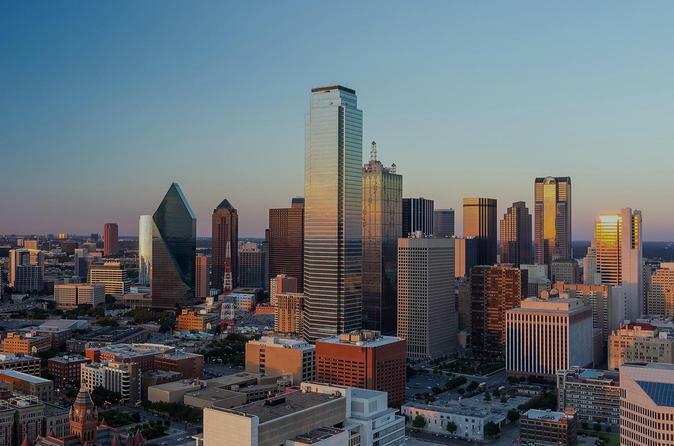 Stops on the tour include Founder's Plaza Observation Area, Old Red Museum, John Neely Bryan Cabin, John F. Kennedy Memorial Plaza, Pioneer Plaza (home to one of the world's largest bronze monuments), Dallas City Hall (design by I.M. Pei), Thanks-Giving Square, First Baptist Dallas fountain plaza, the Deep Ellum area, the Wilson Block historic neighborhood (known for its Queen Anne- and Victorian-style houses), Dallas Arts District, Klyde Warren Park, the affluent town of Highland Park (home to celebrities and other prominent residents), the McKinney Avenue restaurant district in Uptown, West End, and Dealey Plaza National Historic Landmark District, where former President John F. Kennedy was assassinated in 1963.